This is an ongoing record of various events and past projects that have been organized by Dr. Mojab and her research team. Events have included performances, film screenings and gallery exhibitions. Please explore the stories and images. 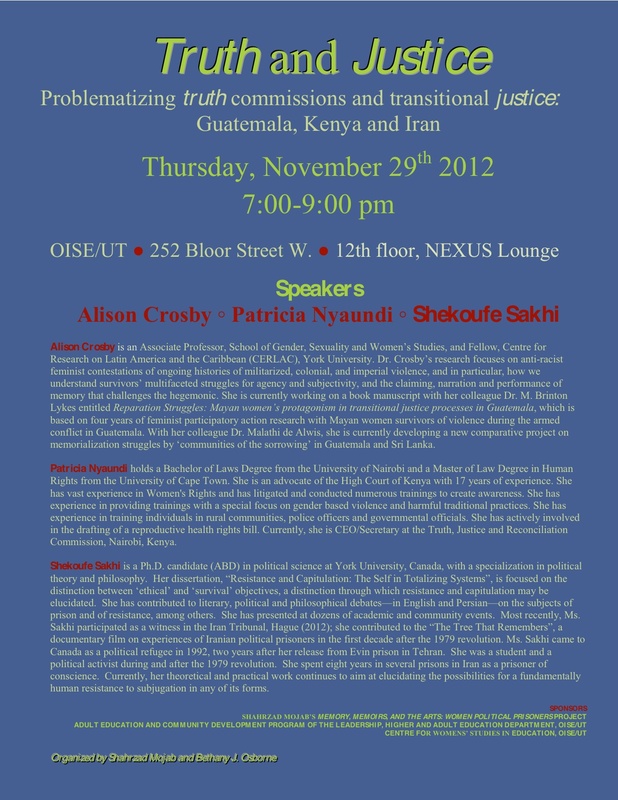 For more information about the Digital Stories project, please visit the Current Projects page. 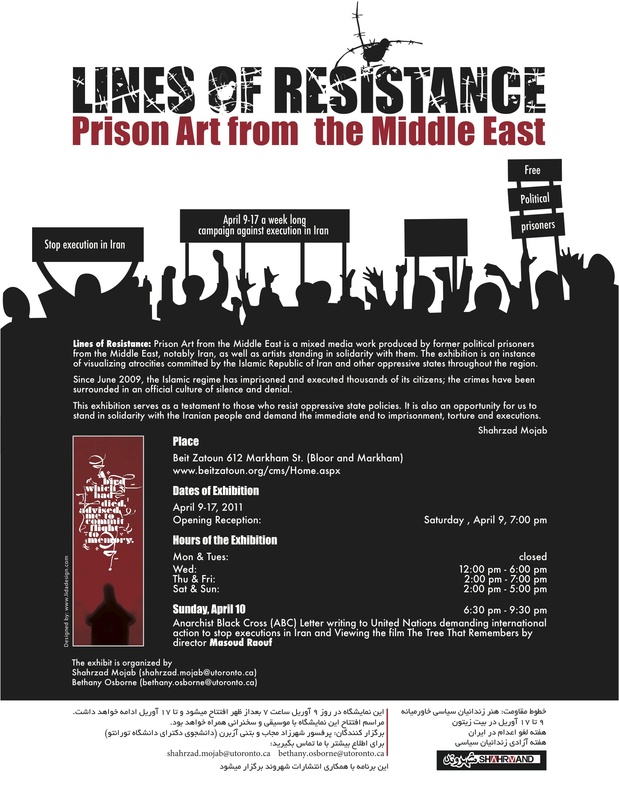 The Lines of Resistance exhibit took place at the Beit Zeitoun Gallery from April 9-17, 2011. 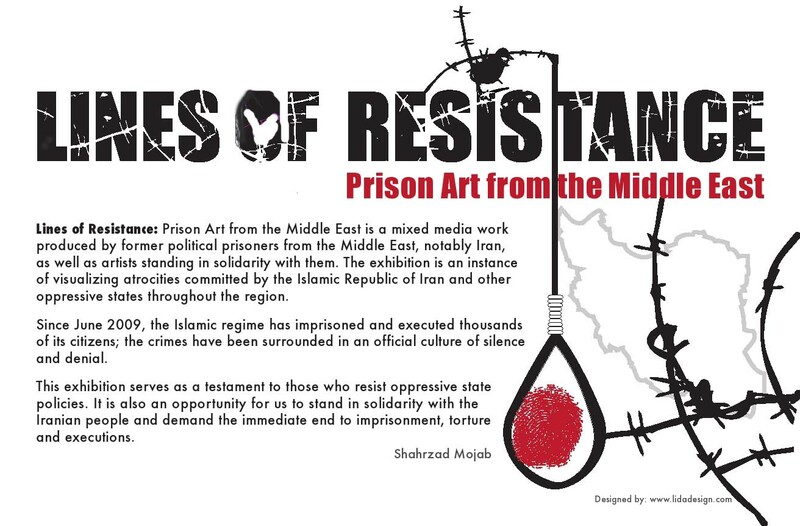 The artwork was organized into three broad categories, Experience of Prison, Resistance and Images of Hope, which can be viewed in their online galleries. Images from the exhibition can be viewed in this gallery below. An informative brochure was produced for the exhibition, and an information sheet was written for visitors to take with them, following the exhibition. Please explore both of these for more information about the Lines of Resistance show. Talking Prison: Creating Art and Making Justice was a multidisciplinary art event held at Hart House at the University of Toronto on June 19, 2010. The event featured dramatic performances, music, and visual art displays. The performance was recorded and documented – if you are interested in obtaining a copy, please contact us! 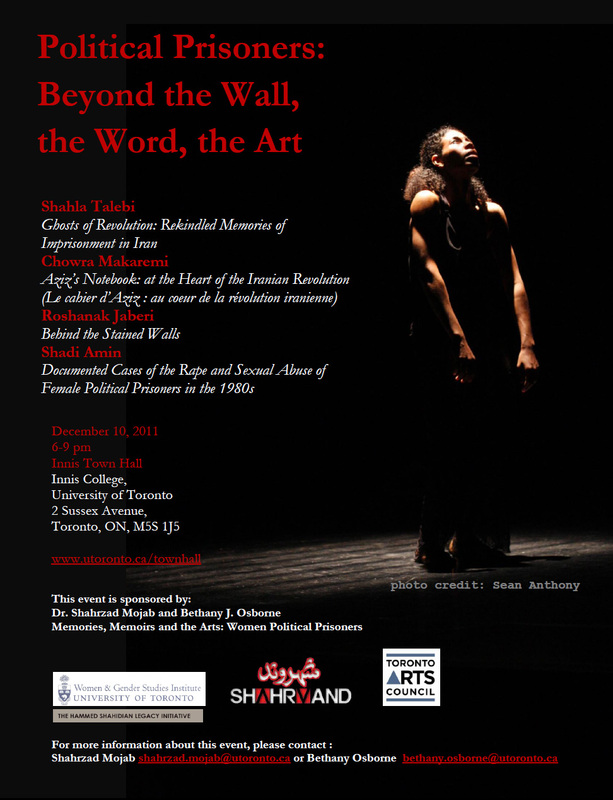 Poster for Political Prisoners: Beyond the Wall, the Word, the Art, an event held at OISE on December 10, 2011. This project had three distinct parts. The first two parts occurred simultaneously while the third part was more about the sharing of experiences with broader audiences within both Canada and internationally. Participants in this project explored various visual art mediums including painting, sculpture, photography and mixed media works (including photo transfer); creative written works including story and poetry; and dance. Participants in this project were either former political prisoners or had been affected by violence in the Islamic Republic of Iran. All of them had a connection to Iran but had also come to Canada at various times over the past 20 years. They began to create art together as a part of arts-based research done by Bethany Osborne. Although former political prisoners faced language barriers in talking about their experiences within the prison system, the art workshops offered a safe place for them to be able to express themselves. A number of individual and collective projects were undertaken over a six month period. At the end of the workshops, the participants decided to continue to meet. The art creation had a therapeutic effect on them as well as fulfilling a community building function. They also had many discussions about speaking out against state sponsored violence through art mediums. There were three initial workshops, exploring writing, theatre and dance. 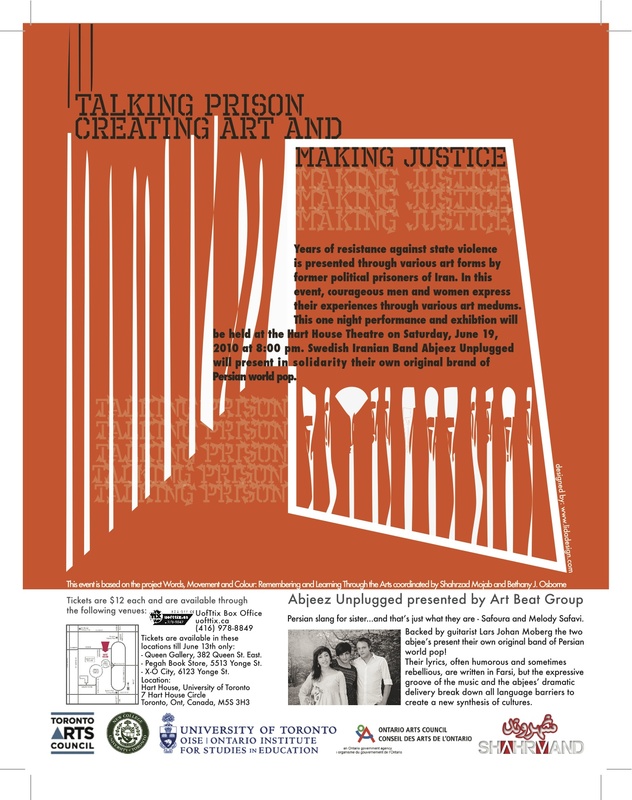 The project culminated in the Talking Prison performance on June 19th, 2010. 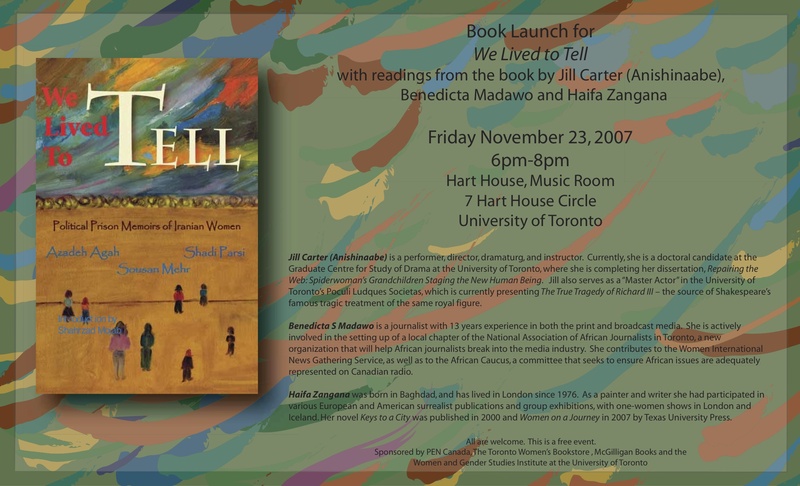 A free book launch for We Lived to Tell, a book featuring memoirs of political prisoners from Iran, was held on Friday, November 23, 2007 at the Music Room in Hart House, at the University of Toronto. 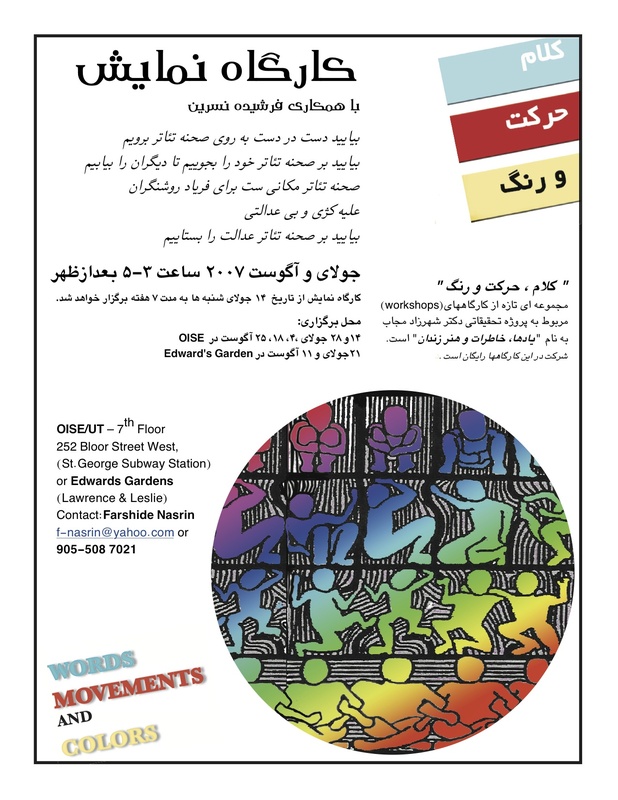 Here’s the poster from the theatre workshop that was hosted at OISE as part of the Words, Movement and Colour project.